This week’s contributing writer, Salomé García, is a professional visual artist who received her BA specializing in conservation from the University of Arts ISA in Havana, after doing internships at the National Center for Conservation, Restoration and Museology in Havana, at RLA Conservation in Miami and Los Angeles, and the Peggy Guggenheim Collection in Venice. She is interested in interdisciplinary practices in art and contemporary art conservation. In contemporary art conservation, the knowledge of the object is crucial; the gathering and registration of information on the materials, production methods, and artist intent forms the basis for responsible decision-making regarding conservation. Artist participation becomes key in this documentation process. For my project entitled “Documentation of installations in the collection of the Contemporary Art Center Wifredo Lam,” I explored methods for communicating with artists, which could work in the specific context of Cuba. The Wifredo Lam Center was founded in Havana in 1983 after the Cuban surrealist artist himself had passed away. The mission of this pioneer institution was to enrich the nation’s cultural heritage by creating a permanent collection of artworks and systematically exchanging cultural documentation with artists working in countries of the so-called “Third World”. 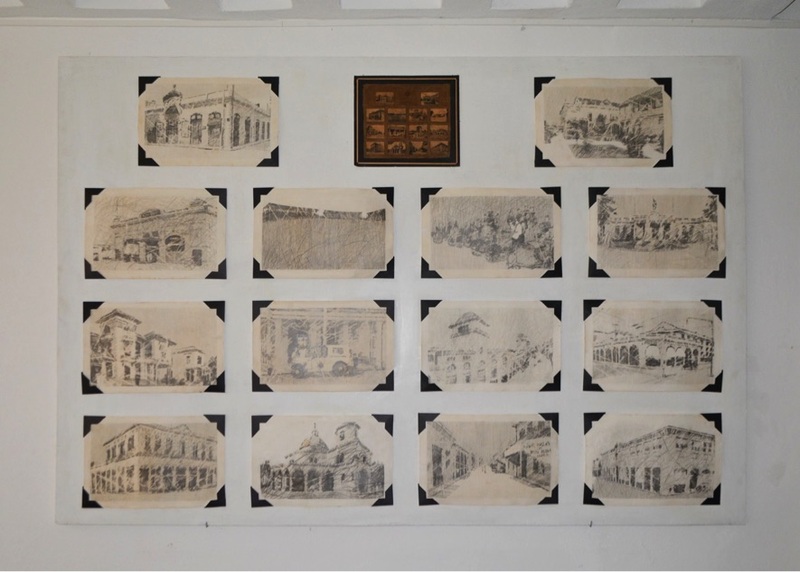 The initial artworks were acquired with the first edition of the Havana Biennial[i] in 1984, thanks to voluntary donations by a group of participating artists. Even without a permanent exhibition space, the collection has continued to grow for the last 35 years, with over a thousand artworks in varied media mostly produced during the course of the Havana Biennials and the exhibitions organized as part of the center’s regular program. Although the study and care of the collection is a current priority of the institution, the staff in charge does not have specialized training in conservation, and they have not been able to maintain an adequate storage space or a complete registration system. All of which has caused the loss of information and, in many cases, of the artworks’ physical integrity. The characterization of this collection and in particular of twenty-two art installations allowed defining this as the most vulnerable section, due to the works’ conceptual and material complexity and the difficulties for their storage and display. Gathering the views and experiences of museum professionals, curators, and artists has been essential to reconstruct the “biography” of the artworks examined. Most of the artists in the collection reside outside of the country and given the current limitations in Cuba, including access high-speed internet connections[ii] that would allow conducting virtual interviews, it was necessary to establish the communication through online email questionnaires. Although some artists responded better to this method than others, the cases of Miami-based Cuban artist Gustavo Acosta and Berlin-based Brazilian artist Alex Flemming proved that the questionnaire could be a valuable tool for low-resource institutions in documenting the artist intent and the meaning of the artworks, therefore contributing to the preservation of their authenticity and to establishing guidelines for future conservation interventions. “Página del Album Cuba en 1925” is an installation by Gustavo Acosta from the 1st Havana Biennial, in 1984. It is, therefore, one of the most valuable and well-documented works in the collection and has been on display several times. The work combines a traditional technique with a contemporary medium and constitutes a unique exemplar in the artist’s body of work[iii]. 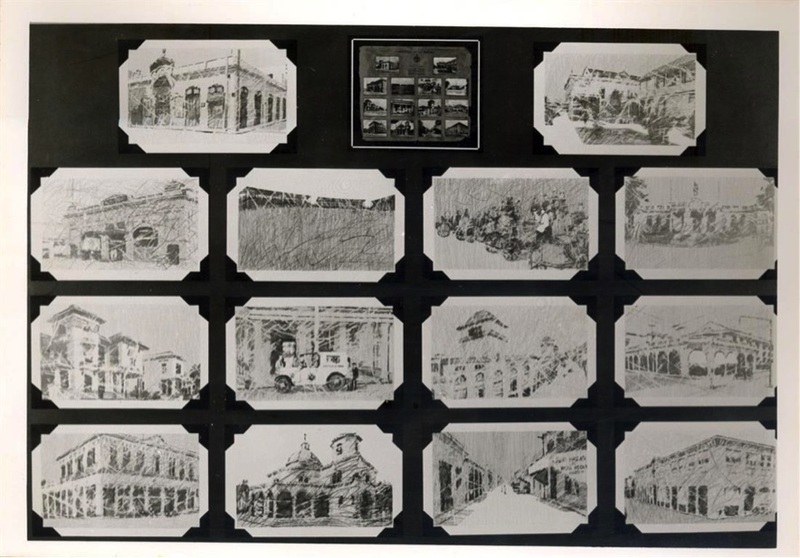 It is composed of fourteen drawings on paper reproducing the found object (a page from the photo-album “Cuba en 1925”), all of which are fixed on a re-fabricated wooden panel painted white (the original gray wooden panel was destroyed after a plague infestation). The communication with Acosta allowed to define the artworks’ “anatomy” and the meaning of each element in relation to his intent, and enabled us to identify the provenance of the materials used, documenting the artist’s creative process. He was asked about the right color for the support and possibilities for protective barriers. Regarding conservation, he declared his preference for the interventions to be conducted by conservation professionals, acknowledging that when he has carried them out himself he has altered the objects. In Acosta’s opinion, an intervention is necessary to restore the work’s authenticity, since the institution’s specialists have misinterpreted it during the reinstallations, as they have replaced the support without consulting the artist. 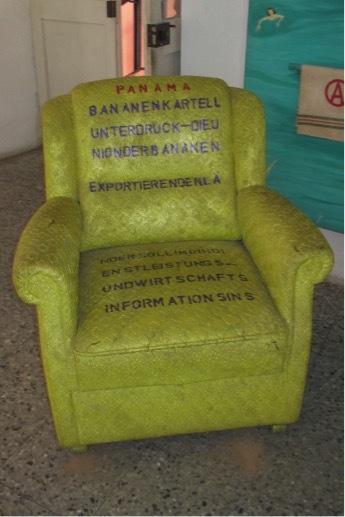 During the 6th Havana Biennial, Alex Flemming presented an installation consisting of a set of painted furniture: fragments of non-Hispanic newspaper articles referring pejoratively to events in Latin America were stenciled on eight chairs and sofas, most of which had been found by the artist on the streets of Berlin. These works belong to Flemming’s series of “Painting on non-traditional surfaces”. Only four of them remain in the Wifredo Lam Center where they have been used as seats in the curators’ offices with the artist’s consent, while the others are guarded in several institutions and private collections in Havana. In a sui generis communication in Spanish and Portuguese, the artist expressed that every object that is part of his installations can also be displayed autonomously. Flemming has defined in his will that his artworks cannot be restored, and the scars of time should be part of them; he doesn’t approve the application of protection layers, but would not oppose surface cleaning or consolidation treatments. When asked about his creative process, Flemming considers himself a mental artist; therefore, he doesn’t produce sketches or keeps photographs of his works: he believes an artist job is to produce, and if the work is of value, someone else will document it. While Acosta is more of a traditional artist, Flemming shies away from usual definitions, which translates into diverging creative processes and approaches towards the conservation of their work. However, standardized questions allowed us to obtain information on these topics, acting as a starting point towards establishing the communication between the institution and the artists in its collection. With the participation of the conservator, such communication becomes a crucial practice in the process of making decisions about the care and display of the artworks. [iii] For further reading Gustavo Acosta recommends the articles on his work by Orlando Hernández, Ricardo Pau Llosa and Suset Sánchez, which can be found on his website. [iv] To gain a deeper understanding on his work, Flemming recommends reading the authors Ana Mae Barbosa, Mayra Laudanna, Angelica De Moraes and Teresa de Arruda.